This salad is very easy ( and quick) to make and on top of that is very delicious if you like zucchini! We LOVE zucchini! I prepare them in so many ways and my family really enjoys them, but this salad since I started making it couple of months ago became a favorite very fast! I came up with the recipe by accident! I had a whole bag of zucchini and no time to prepare them in any way I know, so I decided to try and make a warm salad of them. Here is the recipe, I hope you enjoy it as much as we did! * Note: you can add jalapeno peppers to the dressing or the actual salad if you want! 1. In a large skillet stir-fry the zucchini on high. 2. When they change color ( around 5 minutes) add the green pepper and the garlic cloves. Stir well. The zucchini don't have to be raw but they don't have to be mushy either! There has to be crunchiness to the texture! * Note: your pan has to be big enough so the ingredients are not overcrowded. 3. In 5 minutes serve in a large platter and sprinkle with the dressing. 4. 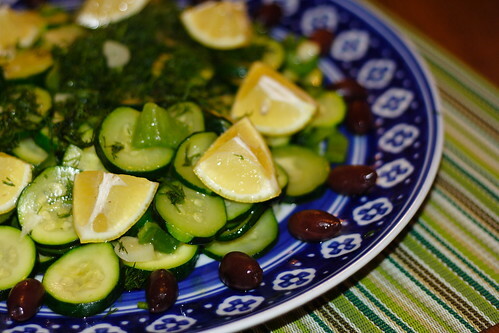 Garnish with lemon and kalamata olives and serve warm. *Note: You can use that as a side dish, serve with wild rise as a main vegetarian dish or with mashed potatoes. Sometimes I add pine nuts, flax seed or walnuts too! Improvise!